What began as an easy way to earn loot and experience points in Destiny has become a full-blown phenomenon. 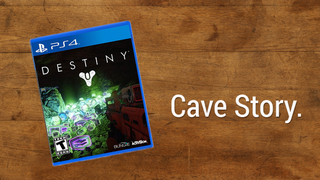 The Internet has caught Loot Cave Fever. The Loot Cave, an area in the corner of Destiny's Russia map that lets you mindlessly farm experience points and gear, has been a known commodity for a while now. Last weekend it rose in popularity—that was when I found out about it, anyway—and these days, it's become something of an obsession among Destiny players around the world. The Loot Cave is what's known as an exploit, a trick the game's developers didn't anticipate that allows players to bypass the game's carefully-scaffolded progression system and earn experience points and gear faster than the developers intended. That so many players would so eagerly latch onto an exploit like Destiny's Loot Cave only makes sense, given the game in question.Destiny itself is brazenly, almost inhumanly exploitative, so it's only natural that players would take every opportunity to exploit it right back. In perhaps the biggest game of the year, one of the things players are spending a lot of time doing is shooting, for hours on end, into a cave. They're not doing it for fun; I've tried it for just a few minutes and I can confirm, it's incredibly boring. But, it's also productive, in the sense that it gets players more of what they want, what they in fact need if they want to progress. So quickly, before it gets nerfed, gaze in awe upon the wonders of… The Loot Cave. he blindfold obscured my vision, I couldn't see where we were going. But I trusted Captain Fal'ric as he carried me in all four of his big strong arms. "We are near." he said, his voice deep and commanding, yet soothing and seductive. He unwraveled the scarf around my head, we were standing at the entrance to a forboding cave. "They call this the cave of treasure." Captain Fal'ric said. "It is said that you will find many treasure in it if you wait long enough." "It looks dangerous" I said, holding onto him nervously. A year ago, I would have never believed I would fall in love with a Fallen. Yet here I was clinging to Fal'ric as he took me into the cave. The pitch black blinded my vision, but my eyes quickly adjusted. But I immediately recoiled with horror when I saw several Hive acolytes staring back out at us from the darkness. "Relax...." Fal'ric said. "They mean no harm. In fact, they are going to help me give you a treasure you will always remember." Immediately they moved in close and started rubbing their hands up and down my body. I couldn't help but let out a long moan, a moan that reverberated through the cave. The unholy creatures were working some sort of sinister magic on me...but I didn't want them to stop. Many limbs caressed and explored my body, I couldn't defend myself....I didn't WANT to defend myself. Falric held my arms up high, exposing my sides and my front as the hive did their work, making me squirm all over the back wall of the cave. Just when it got very intimate, an explosion rocked the chamber. Before I knew it, I could see my dead body on the ground, my ghost holding it in stasis. My legendary and uncommon weapons scattered all over the cave floor. 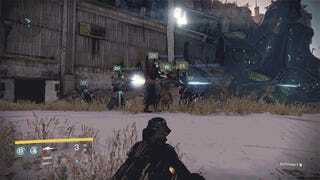 Suddenly other guardians came in and took the loot and went out. More hive rushed out in rage, furious that our moment had been interrupted. On Old Russia as it is on the Moon. Give us this day our daily glimmer. As we forgive those who grief us. But deliver us from the Cryptarch. I've already said my piece on the cave itself, but I continue to find it both fascinating and enjoyable how so many people can wordlessly agree on the rules for one specific thing like this. I love this kind of emergent cooperation, even if (actually, particularly if) it's not what the game's creators intended. Everyone—well, everyone except the dummies who get too close and stop the Thralls from spawning—knows what to do. Even now, it's a bit uncanny to see it in action. No one's quite sure whether Bungie is planning to shut or nerf the Loot Cave at some point in the future, though most people seem to think the end is probably pretty nigh. For now, though, it's been fun. We had some laughs, we got some levels, we scored an engram or twenty. Thanks, Loot Cave.